If hospitality were a religion, this cyclopean hotel would be a cathedral. From far the most impressive -both in term of volume and services- of the many properties which we visited during the whole year 2013, and surely one of the most luxurious, this brand new Sofitel So is a must-be-seen (and a must-stay!) in the vibrant capital of Thailand where hotels are growing like mushrooms. The Sofitel So Bangkok is ideally located, with two facades -and entrances- on both major roads in the central Bangrak district: the busy Sathorn Road, and Rama IV which flows more freely and from where we always picked up taxi. Just cross it -if you dare!- and you get into Lumpini Park for jogging. Renowned architect Smith Obayawat created this impressive structure of contemporary sophistication: beguiling from outside, fascinating when inside, the 29-storey tower, with differing metallic shades and shifting glazed panels, creates the sensual illusion of curves. 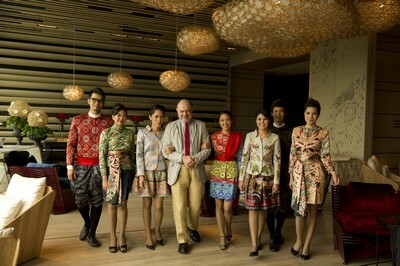 Upon arrival, the smartly dressed -by Christian Lacroix!- nice looking staff was extremely anticipating. Escorting us up to the 9th floor discreet reception-desk at MIXO, Liquids and Stories vibrant social lounge; the ground floor, dedicated to some luxurious shops, with only the concierges and bellboys on duty, can't be described as a lobby. Check-in is softly and quickly managed above the clouds, sitting in a sofa, enjoying a glass of Blue Curacao cocktail concocted in a test tube, turning purple in our glass like in our childhood chemistry classes. DJ mixed lounge music, with quite a lot of French songs, followed us via the lift and the corridor until our “So Comfy” room, perched on the 28th “Water” floor. We became the privileged hosts of one of the Five Elements -Water, Earth, Wood, Metal, and Fire- 238 guest-rooms and suites (up to 138 sqm) inspired by Thailand’s top design firms and an award-winning architect. The "So-Comfy" “Water” rooms are reflecting sophistication and calm. Designed by Pongthep Sagulku of August Design, those 38 sq.m rooms are actually convenient and not crushed by a more and more generalized trendiness where design harms to comfort. 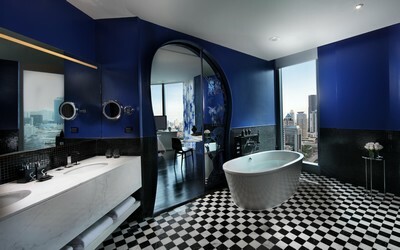 We liked very much the striking view of Bangkok from floor-to-ceiling windows, extending up to the onyx bathtub, in the marble walls connected open-bathroom. We have been impressed by the high-technology provided in this 21st Century room: the lighting is magic, somehow intriguing, but always efficient and so relaxing. The Samsung plasma TV is equipped with DVD player and Apple TV; we used it quite a lot, as the Internet speed was from far the fastest which we ever experienced in Thailand. There is in fact a direct connection to a dedicated broadband server, only for the hotel, making streaming movies on YouTube as fluid as in Western Europe or in the USA. WiFi was also very fast, and complimentary. 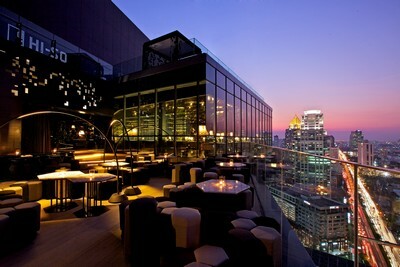 Those on a long stay, or visiting Bangkok for business, will like to know that browsing is not a frustration anymore. Though we didn't make much use of it, we noticed with satisfaction that the well filled minibar (soft drinks, water, but also peanuts and other small crackers) came also with the hotel compliments. The walk-in dressing-room with lots of storage space and a large safety-box showed, if necessary, that we were staying in a real palace hotel. We had the chance to inspect further thematic rooms in this hotel mapped like a “Tree of Life”. Though our favorite category of room/floor are the warm and cozy “Water” and “Earth”, we would like to recommend the “Wood” to those looking for a more classical, somehow easier-to-deal-with design. Our next stay at Sofitel So will be definitely in the fairy-tale, magically designed “Earth” rooms: painted in a somehow hypnotic shade of blue, they won't please all the visitors, for sure. But we loved them at first sight: we would recommend them to honeymooners, for instance. Businessmen should straightly book in a “Earth” room. No butler, but “gurus” in duty come up to the room within less than five minutes whenever you need them for anything, from room service to technical inquiry (surely related which how to use TV or lighting if you are not a geek...). 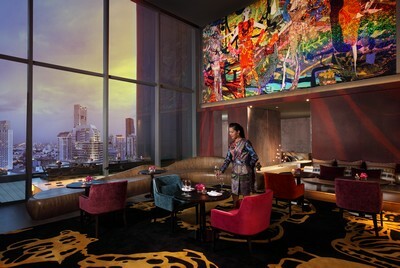 All the guests are entitled to this service; the unique -we actually say UNIQUE- privilege at Sofitel So Bangkok is the fantastic “Club Signature Lounge”. From our longtime travel experience, we would say that only the neighboring Dusit Thani can compete in term of exclusivity. The size and design of the Club still give some advance to the Sofitel So: located on the 25th floor, it has plenty of tables and sofas with a view, plus a very unique panoramic terrace where we could smoke cigar “al fresco” after dinner. Club Rooms and large suites guests are entitled to use the Signature Lounge. This plush experience starts from breakfast (so rich!) till evening snacks (the staff visited our table plenty of time to refill our dish and our glass), not to mention high-tea with signature pastries and the best blends from Asia and India (great espresso coffee also!). The designer is... Christian Lacroix! Again! He painted the large colorful fresco next by the terrace; opposite, he drew his signature in red letter on the concrete wall. This luxury experience made us discover Bangkok in a new light, and comes atop all those sophisticated things which will make us come back, again and again, at Sofitel So. There is only one inconvenient in that kind of hotel: it features so many resources that time is not enough to enjoy all of them. We just could peep in the So SPA, located on the 11th floor, providing rejuvenating health & beauty treatments, involving refined French cosmetology. 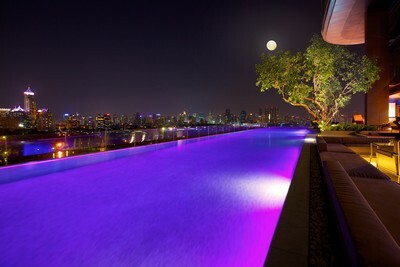 We would have loved to join one of those amok evening parties organized during the week-end on the 10th floor Infinity pool garden terrace. Or to exercise in the So FIT fitness centre, displaying iconic design and high-tech equipment with personal trainer. Room rate at Sofitel So Bangkok starts from THB 5,400++ (room only) for a "So Cosy Room" during the low season, until THB 9,700++ (with Breakfast + Club Benefits) for a "So Club Room" during the high season. 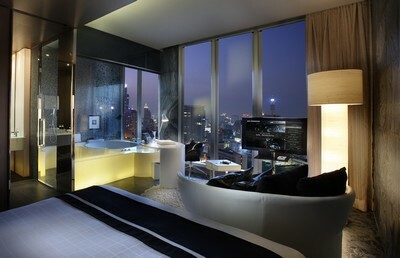 Suites start from THB 11,700++ (with Breakfast + Club Benefits). Five elements and five star, this is one of the leading luxury hotels in South East Asia. This might sound a play on words, but the Sofitel So is really the new haunt for the high-So: attracted not only by the modern and chic concept, but also by a luscious cuisine paired with a very unique selection of wine from France, Italy and the “New World”. A favorite for the young, casual local youngsters, Red Oven, introduces itself as a showcase kitchen representing passion for the culinary arts. We sat there a couple of unforgettable hours, for a legendary buffet dinner. Not one of those sickly “all you can eat” exhibition of cheap food, but live cooking stations, boosting a selection of fresh seafood (where rock lobsters come from Phuket, and oysters from Normandy), cooked-to-order warm foie gras or roasted lamb from Australia and New Zealand, French baguette and special breads directly from the oven, crispy pizza and the best Japanese specialities in Thailand (not only shushis...). The cheese was cautiously selected and ripened: it featured French “Pont L'Evêque”, Swiss “Tête de Moine”, Spanish Manchego (we tasted it with fabulous “Jamon Jabugo” ham) and other imported regional brands. The pastries were so refined, that we could believe that Pierre Hermé came from Paris to prepare the ideally textured and yummy macaroons just for ourselves! At less than EUR 50 (with one glass of wine), where could be find better value downtown?